My love of Purple Sprouting Broccoli is well-known, so it won't surprise you to learn that I have planted some for next year's crop. This year (2017 - 2018) I had 4 plants and they produced a lot of broccoli. Jane is not particularly keen on this veg (certainly not as keen as me), and I find it hard to keep up with the harvest when I have so much, so this year I am going to grow only 3 plants. I put the little plants in the bed recently vacated by my Broad Beans. The soil was very dry, so I watered it copiously before and after planting. In order to give the plants the best possible chance of thriving, I have protected them against the Cabbage Root Fly with the homemade cardboard collars I always use for my brassicas, and I have covered them with some scraps of Enviromesh supported on wire hoops, which will keep the butterflies off them. The Enviromesh and hoops will only be useful for a couple of weeks, because I hope the plants will soon grow a lot bigger, but at least it will give me time to sort out something better and taller. My "garden hardware" is currently being shared between my own garden and the one up at Courtmoor Avenue and I haven't really got enough for both. In other news... I picked my first cucumbers this week. These are "Marketmore" (foreground) and "Delikate B". We ate the first cucumber in a salad, along with tomato and fresh Broad Beans (cooked and cooled), smothered in olive oil flavoured with dried Oregano. It was lovely! Also, the chillis are coming on rapidly now. Although at one stage earlier in the year it seemed I might not have any harvest at all, the plants have recovered well and are forming lots of fruits. These ones are "Cayenne". January - Composting. Emptying the compost bins and putting the compost into containers for later use. February - Chitting. Seed potato tubers in egg-boxes, chitting (sprouting) on the windowsills. March - Waking. Rhubarb plants "waking up" after their hibernation. April - Sowing. This is the month in which most of my seed-sowing is done. May - Planting. This is the month in which I do most of my planting of seedlings like these brassicas and beans. June - Lifting. June is the month in which I start lifting potatoes - usually container-grown ones like these "Juliette" ones. July - Growing. The raised beds are full of swelling vegetables. Not prime harvesting time yet, but looking after the veg carefully now will pay dividends later. August - Harvesting. This is the month in which the harvests are most abundant. September - Preserving. The late Summer harvest is dried, pickled and pureed to preserve it for Winter use. October - Turning. Like when the leaves turn from green to red, yellow and orange. November - Protecting. The cloches are deployed to provide protection for over-Wintering plants like lettuces and chicory. December - Planning. A very pleasurable activity during the depths of Winter - planning garden projects and what to grow in the forthcoming year. One of the chief attractions of gardening as a hobby is its infinite variations. Although the gardening year usually follows a general pattern, no two years are the same, and the challenges presented by weather, pests, diseases and the vagaries of plants themselves are different every time! I think the ever-growing effect of Climate Change is probably the biggest challenge of the lot, because it brings us increasingly unpredictable and often extreme weather. Old gardening books sometimes tell us precisely when to sow each different type of vegetable, but these days I think it is unwise to rely on such advice. Instead one has to develop a "feel" for the conditions - and more than ever before - trust to luck! This is phase 2 of my comparative trials with container-grown potatoes. You may recall that I planted two pots of each type - one with a single seed-tuber in it, and one with two. With the "Annabelle" potatoes I harvested the other day, the 2-tuber pot produced almost exactly twice as much as the one-tuber pot, but with these "Juliette", the result is quite different. Irrespective of the weight, these are nice potatoes - very clean and smooth. Another bonus is that there were very few of the tiny ones that aren't worth cooking. My conclusion from this result is that it is still worth putting two seed-tubers in each 35-litre pot. The yield per tuber is not twice what I got from the single tuber, but the yield per pot is better, and seed-tubers are cheap (17p each), so there's no point in scrimping. I have started lifting my container-grown potatoes, which means that the containers are being released and can be re-used for another crop. This is the latest batch of potatoes. They are ones of the First Early variety "Foremost". They are some of the ones I have grown from tubers I picked out of the soil at my Courtmoor Avenue plot when I was digging it over last Autumn / Winter. If you are a regular follower of my blog you will know that I wanted to grow as many things as possible that would preserve the continuity of cultivation, and these potatoes were part of that. My photo shows the yield from three very tiny seed-tubers planted in one pot. They are certainly not perfect specimens, but in the circumstances, I'm pretty pleased with them. I gave them to my "Landlady", who was thrilled to receive them - especially when I explained their provenance! Anyway, now that some pots are becoming available again, I have been putting them to use for a second crop. I know from experience that a second crop may not perform very well, due mainly to the late planting and the fact that the nutrient levels of the compost / soil mixture will have been depleted by the potatoes, but it's still worth having a go, though it may be advisable to give the compost a boost with something. In one of the pots I have planted two spare Kaibroc seedlings. These were from my second sowing, after the first batch was destroyed by the Cabbage Root Fly. I have some more up at Courtmoor Avenue, planted in the ground. Kaibroc is a hybrid vegetable, whose parents are Chinese Broccoli (Kailaan) and the more well-known Calabrese-style broccoli. I think it will not grow very big, (certainly not as big as Purple Sprouting Broccoli!) which is why I have put two plants in the one 35-litre pot, not just one. Into the second pot to become available I have sowed some Carrot seeds - the little "finger" type. The variety is "Amsterdam 2 Solo". It will be a while before anything is visible (assuming they DO actually germinate), but hopefully I'll get some sort of a crop before the Autumn. I have covered the container with a wire grille (a shelf from one of my plastic mini-greenhouses) to dissuade the foxes / badgers from rootling around in it. I know this will sound like Tempting Fate, but I think the Spring / Early summer sowing and planting frenzy is over now - at least in my garden and plot. Yes, it is still possible to sow seeds that will mature into a harvest this year, but most of the hard work has been done. Unfortunately we haven't been able to use this sitting-out area much this year. although we have had plenty of dry (and some sunny) weather recently, it has always been so windy that sitting outside is not pleasant at all. As you can see, most of my garden is devoted to growing vegetables, but I do have a few shrubs and flowers - the latter mostly in pots. Although most of my planting is finished, my garden is still littered with trays of seedlings. For instance, I'm keeping these brassicas as possible replacements for casualties in the war against the pigeons up at the Courtmoor plot. I also have a couple of trays of chicory coming along, for planting out in a month or so. I'm not convinced that sowing them in those little modules was a good idea. Keeping them in good condition is difficult. With the weather being so dry and warm I find I have to water them about twice a day. I have one other thing to mention today. One of my daughters sent me this lovely Bug Hotel as a Father's Day present. I hope it proves popular! One of the chief advantages of growing vegetables in your back garden, as opposed to on an allotment or plot some distance away, is that you can pick what you want when you want - be it a lot or a little. This is very true with my Broad Beans. It only needs about 200g of beans (unshelled) to make a serving for one person, so unless there is any pressing reason to do otherwise, this is how I pick them - in small quantities, as required. This particular batch, weighing 475g, contained pods from two different varieties, one of them a lot longer than the other. The difference between the two was even more obvious once the beans were shelled! I'm fairly sure now that the green beans in long pods are "Imperial Green Longpod", and the shorter grey ones are "Witkiem Manita" - but I may be wrong! By the way, the herb with which I cooked these beans is Winter Savory, which is perfect for this type of bean. It has a sharp flavour, a little reminiscent of Mint, but more citrussy. With reference to the question "How do I know if my beans are ready for picking? ", I offer this little tip. The pod should feel taught / firm, and you should be able to see and feel the outline of the beans within it. If it is soft and seemingly full of air, the beans inside will still be quite small. Of course there is a judgement to be made here: if the pod is TOO firm, the beans may well be over-mature, so you need to give a couple of the pods a gentle squeeze every few days once they look as if they might be ready. In any case, if the beans are over-mature, you can still rescue them by removing their skins as well as their pods (sometimes referred to as "double-podding"), which is really not necessary if the beans are young and tender. In terms of yield, I expect to get something like 2kgs in total from the 20 plants I have in my back garden. This will be augmented by others from up at my Courtmoor Avenue plot, where I have a further 30 plants. 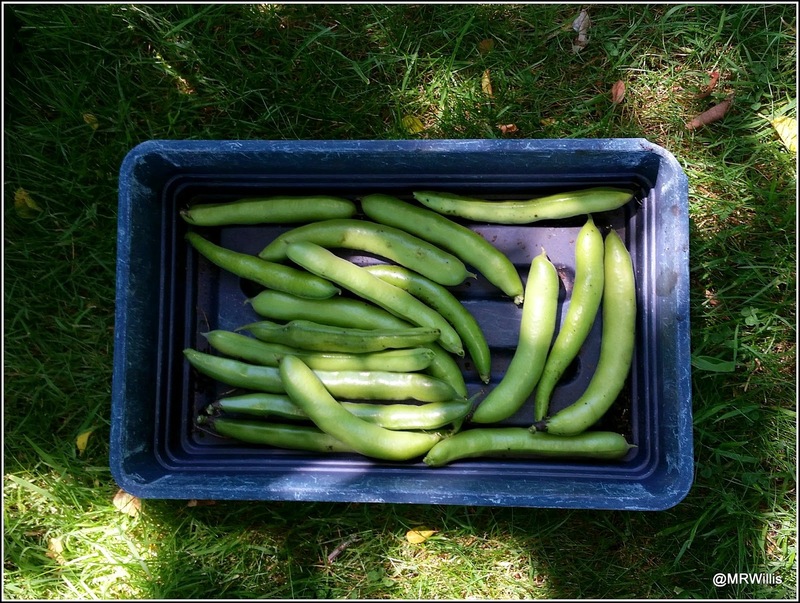 The ones at the Courtmoor plot are much smaller and have fewer pods on them though, and the yield will certainly be proportionately smaller. I'll definitely not have enough beans to make it worth freezing any, and we shall be eating them "little and often". I've mentioned before that some of my potato plants at the Courtmoor plot have been afflicted with Blackleg disease. It was obvious to me that they were not going to produce much of a crop, and were just taking up valuable space that could be used for something else, so I made the decision to cut my losses and pull them up. I also lifted five very small plants grown from tubers I "rescued" from the plot when I was digging it over during the Autumn and Winter. They were of the variety "Foremost", which is apparently a favourite of the plot-owners. It's a total of about 1.1kg - a pathetic yield, but better than nothing, I suppose. The round ones are "Foremost" and the oval ones are "Jazzy". After lifting the potatoes I dug over the soil where they had been, and levelled the ridge with a rake, before planting some more brassicas in the vacant space. This time I'm taking no chances and I have installed anti-pigeon defences right from the start! While I was in the mood for planting, I also planted four Aztec Broccoli (Huauzontle) plants. The only place I could find for them was over near the squashes. Never having grown this stuff (or even seen it), I'm not really sure what to expect, but I believe the plants can reach about 5 feet tall in suitable conditions. I suspect that these ones will not consider their location ideal, so they will probably not get very big. The soil they are in is very dry and sandy, so I watered them copiously after planting, to help them settle in. This week I harvested my first potatoes of the year, some First Earlies called "Annabelle". To get a fair comparison, I planted two pots of each of my varieties of Early potato, one with a single tuber in it, and one with two. The pots were filled with exactly similar compost and fertiliser, and placed right next to each other. I have watered them with exactly the same frequency and I will be harvesting both pots on the same day. Should be a fair test then. These are the two pots of "Annabelle". As you can see, the foliage had collapsed and was beginning to turn yellow, indications that the crop was ready for lifting. So, the moment of truth! I just tip the pot over, spilling its contents onto a groundsheet. This is the pot that had just one plant in it. This is the pot that had two plants in it. It's always an anxious moment when you do this. Will there be lots of lovely potatoes, or just a few? Will their skins be smooth, or covered in Scab? Well, these ones looked pretty good. I placed the tubers from each pot into separate containers, impatient to see how many there were in each. You'll notice that there are potatoes of many different sizes there. For a fair comparison, I discarded from both lots any tubers that were too small to be worth eating. There were probably about 10 or 12 of these in each pot. There are also several potatoes that are on the large size for First Earlies, which tells me that I could really have lifted these a week or ten days earlier. When I have grown "Annabelle" previously they have been more even-sized. OK, so now for the results. Having taken the potatoes indoors and washed them, I weighed both batches. The 1-tuber pot yielded 628g and the 2-tuber pot yielded 1237g. So the two-tuber pot produced slightly under twice the yield of the one-tuber pot. So what does this tell me? I think it demonstrates that a 35-litre pot can easily accommodate two seed-tubers with no effect on yield. Next year I shall revert to putting two seed-tubers in each pot! It means I can get twice the yield from exactly the same space that I would use if each pot only contained one plant. Of course this is only the first of my four container-grown potato varieties to be harvested. The other 3 may produce different results. And just for the record, my view is that although First Earlies are typically harvested small, the yield from these "Annabelles" was on the small side. This may possibly be a result of the strange roller-coaster weather conditions we have experienced this year. On the Plus side though, the potatoes are nice and clean, with very little Scab. I attribute this to the high organic matter content of the growing-medium, which was about 50% home-made compost and 50% garden soil from a dismantled raised bed.